Outboard motorboat towing a house on the Indian River portion of the Intracoastal Waterway near Rockledge, Fla. Courtesy, Ralph Crawford. Born in Providence, R.I., in 1846, George Lothrop Bradley had made three fortunes by the time he had become the largest investor in the Florida waterway. Bradley made his first fortune investing in the Newport Mining Company, a square-mile iron mine property along the Michigan upper peninsula-Wisconsin border, in the late 1870s. The mine would produce ore for another seventy years. His second fortune came when he invested in the Mergenthaler Linotype Company, an enterprise based on the invention of a new method of publishing. Molten lead would be poured into an entire line of type instead of composing a line of type single letter-by-single letter. Bradley made his third fortune investing in Alexander Graham Bell’s new invention–the telephone. Civil War financier Jay Cooke introduced Bradley to his fourth opportunity to become even more wealthy by investing in the Florida canal company beginning in the mid-1880s. Courtesy, Emma Pendleton Bradley Hospital, East Providence, R.I. This entry was posted in Atlantic Intracoastal Waterway, Boston and Florida Atlantic Coast Land Company, Electrolytic Marine Salts Company, Florida Coast Line Canal and Transportation Company, Florida history, Land History, Providence, Rhode Island, Waterway History and tagged Bradley, Geo. L.; Intracoastal Waterway on September 10, 2013 by Florida's Big Dig. In 1882, the Florida Coast Line Canal & Transportation Company (“the Florida canal company”) began dredging the difficult dry cut between the Matanzas and Halifax rivers using bucket, continuous chain dredges. 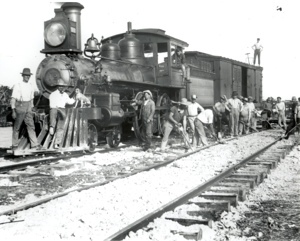 The Florida canal company would not complete the work until 1912, thirty years later. For dredging what would become the Intracoastal Waterway from Jacksonville to Miami, the company would earn over one million acres of state land for dredging 268 miles of waterway and the right to collect tolls from waterway traffic. Courtesy, St. Augustine Historical Society. This entry was posted in Uncategorized and tagged Intracoastal Waterway on September 8, 2013 by Florida's Big Dig. Double-tracking the Florida East Coast Railroad signaled the end of commercial waterborne traffic along Florida’s east coast and the end of its only competitor in the 1920’s, the privately owned Florida East Coast Canal, later transferred to the Federal government in 1929 for conversion into the modern, toll-free Atlantic Intracoastal Waterway. 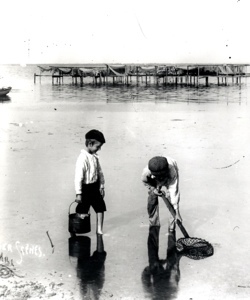 Young barefooted boys digging for clams along the western sandy shore of the Indian River ca. 1900, with a long dock draped in nets in the background. Courtesy, collection of the author.